This is my second or third (maybe even my fourth or fifth) attempt at blogging regularly. My goal? To become a "writer" by writing and posting to my blog for the next 30 days. I'm making this goal public to help hold myself accountable (against the sound advice of a wise colleague-sorry, Dan!). During the next 30 days I hope to cover a variety of topics, from my one word for 2017, to some of the great things I am working on at school, and the return of my weekly (can I call it that if it only lasted for three weeks?) series, #PodcastPD. This goal is ambitious and, to keep myself on a path to success, I am creating a plan that will hopefully make these 30 days easier than I fear they may actually be. Gather ideas in my Lunacy Field Notes - My list is already quite extensive, but I will continue to add to the list; inspiration could strike anywhere. 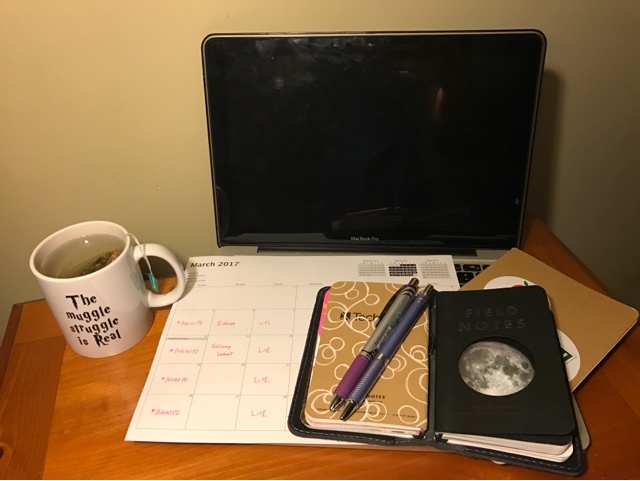 Use a calendar to help plan specific dates for posts for the month - I always find that having a rough, yet flexible, plan for when things will happen helps keep me focused and moving forward towards my goals. Use the Edublogs prompts (and others) when ideas are waning or I'm feel uninspired - Sometimes stepping away from your own thoughts and ideas and working with ideas shared by others is the proper dose of creativity that I need to get moving when I'm stuck. Set aside a daily focused block of time for writing - Putting something on my calendar makes it stickier than having a loose commitment or task on a to do list. I find that scheduling time with myself for important activities is what it takes to make sure things happen. Create an atmosphere for writing - I am NOT one who works well in silence. For me, the perfect place is a comfortable seat with quiet music and my notebook and favorite pen. Add a cup of tea and let the words fly. While this is only day one in my 30-day adventure, I am excited to get started. Here's to another 29 days of writing. What habits or strategies do you have in place to build your writing muscles? Thanks! Please help me stay accountable. I'm thinking this could possibly lead to a redesign of my site. Interested in helping out? I like to keep ideas on a Keep note shared between both of my Google accounts (personal & wwprsd). I also keep a couple of posts in draft mode while I continue to work on them until they have everything I think they need (I don't work on one post at a time). I also ( :-P ) don't follow a rigid schedule of posting everyday, making sure I post each Monday, etc. so I don't feel pressured to have to post. I will make sure to encourage! Thanks for sharing your process, Dan! I like the idea of using Keep, but since I KEEP my notebooks with me almost all the time, hopefully it will work out. And for the times I am without my Field Notes, I can use Keep. As for the schedule, for me it's about building the habit and making it stick. Hoping I don't regret it. Continue to share your thoughts, you know I like feedback.